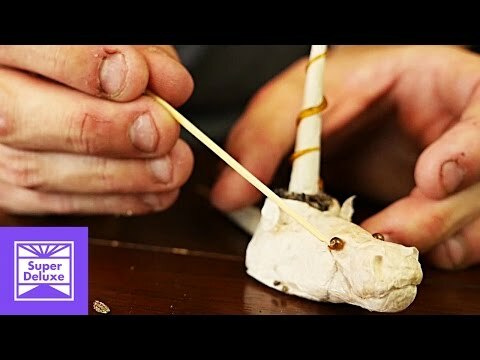 Tony Greenhand, the world’s best roller, shows us how to make a dank unicorn joint. Nothing says special and unique like a unicorn. That mythical creature that looks like it has a giant joint put out on its head. Now, ganja guru Tony Greenhand has put his Spiffigami skills to the test and brought us the secrets of making a unicorn joint. Check out the channel that helped make it happen, Super Deluxe. Want to see what else Tony Greenhand is up to? Just follow his Instagram. After grinding plenty of herb, the first paper you grab needs to form a box. To do this, fold a line parallel to the glue, from the edge to the center, and unfold. Now in the other direction, fold the paper in half, then open. Now fold the halves to the center line and open again. Use the creases from the three lines to cut halfway through the paper starting on the glue side. Fold the paper and create a square, using the glue strip flaps to fold the box and seal the bottom. With an extra square off of another paper, seal the side of the box together. This part is pretty simple. Use some papers wadded and shaped into a horse head shape, and cover with a smooth paper. If you want to step it up, you could slide the filler paper out after and stuff with herb. Make a second box with a slightly smaller paper than you used on the first. layer herb on the bottom of the big box and put the second one inside. Fill the sides with herb. Now, use strips of paper to seal the two boxes, with a hollow center opened on top. Cut slits a quarter inch into the end of a paper and roll a cone joint without a filter. The pointed end will be the lit one; the wide end with slits the base. Use a toothpick or paperclip to poke an air path inside. Flare the slits open. Make a hole in the center of the inner box on the base. Now line the holes up, remove the toothpick, and seal together with glue strips. Repeat this process for the neck to have a joint to smoke from. Greenhand takes this toke to another level with some special touches. With the horse-head attached, he adds dabs of dab for eyes. The horn gets a swirl of resin for the spiral effect, and he even makes some bows, eyebrows, ribbon for the mane and a little joint for the unicorn’s mouth. The space around the horn also gets packed with loose herb for appeal. This unicorn joint is a sculpted masterpiece! Will unicorns come back from the brink of extinction, or will their numbers disappear in a puff of smoke again? Show us your smoking creations on social media or in the comments below.